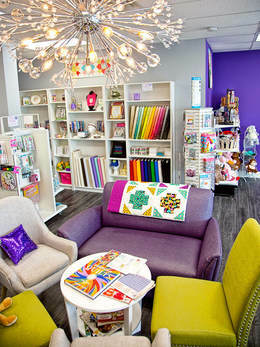 Unlease Your Creativity at The Sparkly Elephant Sewing Lounge! 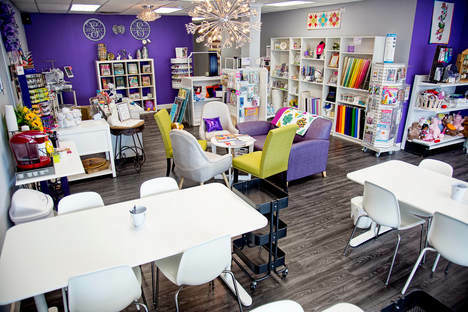 The Sparkly Elephant Sewing Lounge is a modern maker space located in Friendswood, TX. We have craft/sewing working space, sewing machine rental, classes, embroidery services and retail. We also host the Gulf Coast Modern Quilt Guild meetings once a month. Please come by and see how you can unleash your creativity in our space! Official open sew at the Sparkly Elephant Sewing Lounge is scheduled for Tuesdays and Thursdays 12-3. However, if the lounge is open and there are no classes occurring, you are welcome to come in and work! We have chairs for hand stitching/embroidery and tables available for sewing machines and working on projects. We also have a large work table, cutting mat and ironing boards available for working. We have all kinds of classes here at the Sparkly Elephant from Get To Know Your Machine to quilting, working with different kinds of fabrics, bag making and more. Please see our calendar for all our classes, descriptions. You can sign up from the calendar or go to the Shop tab and find all the classes as well. If you have a craft group who would like to reserve a regular time for meeting, please contact the owner, Andria Niles, at sparklyelephantsewing@gmail.com or 832-895-9208. We'd love to welcome you into our space! Includes: Sewing machine usage, needles, select thread, bobbins, scissors, rotary cutter, rulers, iron. Members will also get special coupons, priority registration for classes during that month, invitations to special sew-ins and events held during that month. Once our serger is available, they will be able to learn and use the serger. This is the perfect opportunity for someone who wants to experiment with sewing as a hobby they want to pursue more seriously or who would like to use a higher end machine for a short period of time. Enjoy all the benefits of a full membership, but with the use of your own personal machine. This is great for someone who has a machine, but doesn't have the available space at home or is still building their stash of sewing supplies! Please visit the shop or email sparklyelephantsewing@gmail.com to register for a membership! The Sparkly Elephant Sewing Lounge is available for special group events of up to 20-25 people (depending upon the event). Please contact sparklyelephantsewing@gmail.com or call 832-895-9208 for more information on renting our space!